You will be greeted by a representative from Travel Corporation Nepal and transfered to your hotel where you have some time to rest. In the evening you have a welcome dinner and we discuss the details of the tour. Nepalgunj is a steaming hot city in South Western Nepal, in the lowlands of Terai, close to the Indian border, which is just 8km away and also the gate way to Dolpo. 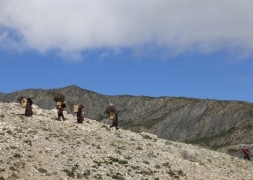 Culturally the area more resembles India than the upland of Nepal. Take a cycle rikshaw for a ride in town. The Bageshowri temple is one of Nepal's most important Hindu temples and is worth a visit as well. We stay overnight at hotel. Dunai is the headquarter of the Dolpa District. It is situated at the slope at the other site of the river, overlooking Dunai. 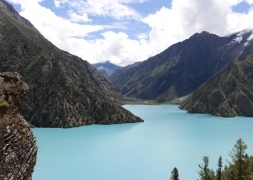 A bit further away from Dunai, at the same slope, we can find the Dolpo Bon School and Hostels, the Bon School educates children in the Bonpo religion, Tibetan culture and Tibetan language. Leaving Dunai, we soon walk in a beautiful mountain landscape, which sometimes reminds to the European Alps. Rocky slopes are dotted with pine trees, mostly blue pine. At the horizon we see the snowcapped Kang Tokal (6294 m). The path goes slightly up and down, following the Thuli Bheri River. 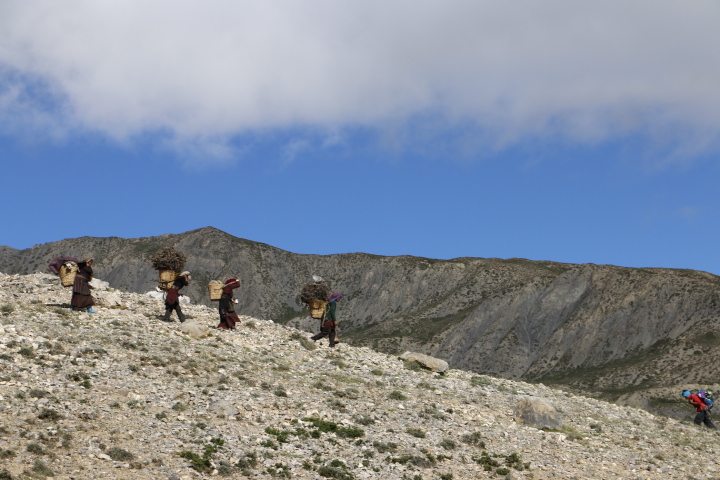 We cross the Buddhist village Byasgar (2427 m). 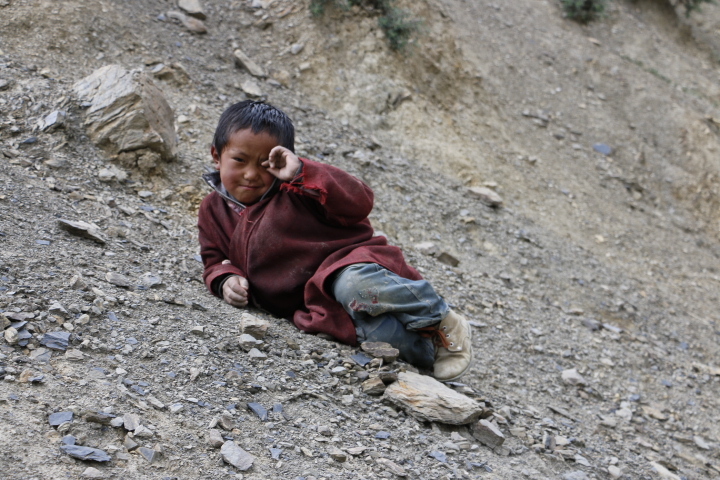 The people who live in this region are Tarali's, a Magar group. 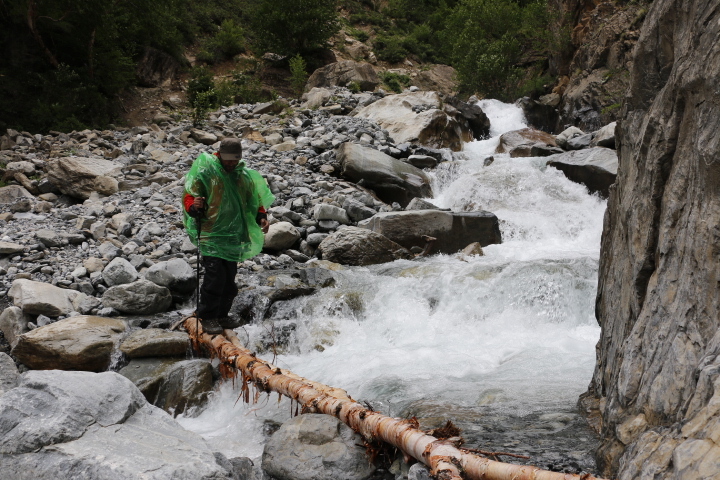 After Byasgar, the landscape gets quickly more rough and rocky. The path is sometimes carved out of the rocks, and at a few points very narrow. Walking through the huge challenging finally we reach to Lingdo, a small village where we stay overnight at tented camp. The path is gradually going up. Along the way we have a good view to some of the villages in this region, like Sarankot, which is situated high on a cliff. 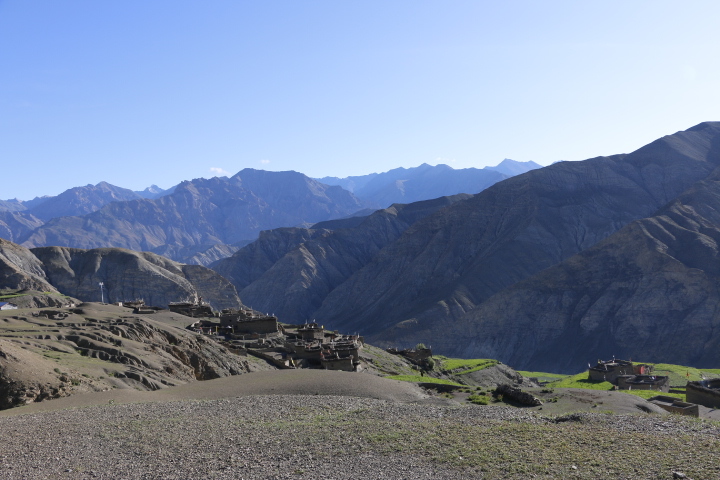 These are the last villages we will see till we reach Dho Tarap. We pass some Mani walls and chortens. The landscape is impressive and sometimes very green. Sharp rocks are dotted with junipers and other pine trees. The trail climbs high on a slope and goes high above the Thuli Bheri River, leading to a large suspension bridge (120 meter long), high above the river as well. 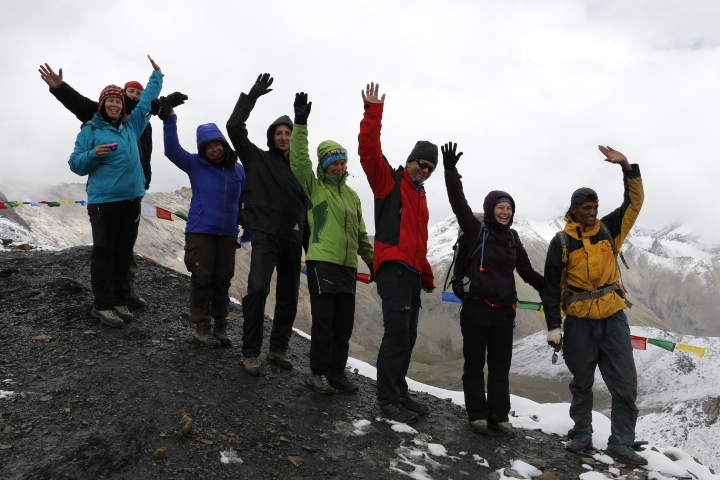 We reached Laisicap (2772 m). On the other side of the bridge after Laisicap it's a long and strenuous climb of about 3 hours to Laina Odar (3370 m). The path partly goes through forests and we are surrounded by steep cliffs full of pine trees, some of which are huge. Close to Laina Odar, the path goes along the river again. We stay overnight at tented camp. The trail goes through the dry or more barren landscape passing by river valley with high rocks towering on our both side. In this barren landscape the blue sheep lives. If we look out for them we have a big chance to see big groups high on the slopes. It's a fairly easy walk, gradually going up. At some parts the path is beautifully carved out of the rock. 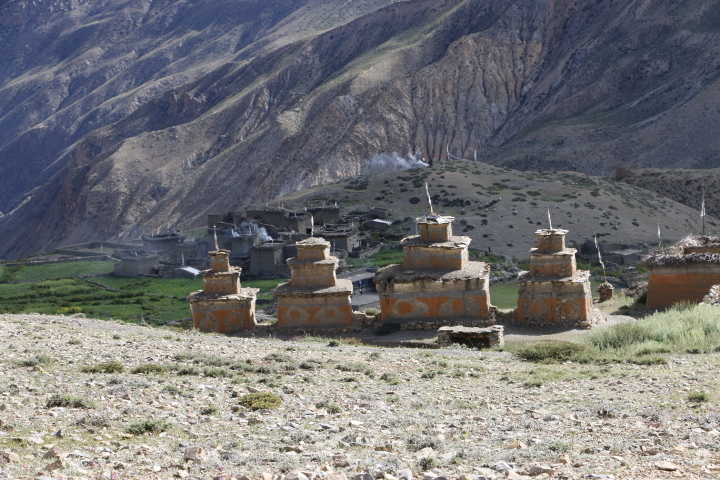 The path climbs steeply for about half an hour to a small pass with a nice chorten (stupa). From the pass, it's 30 minutes till Sisaul (3750 m). The trail climbs to another small pass. Shortly after the pass, the valley suddenly widens. The trail stays besides the river. 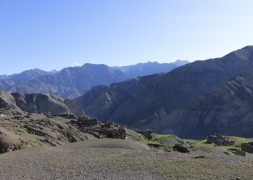 At the horizon a small collection of houses is appearing in between the mountains: Dho Tarap. Getting nearer to Dho Tarap, we cross many Mani walls and small chortens. A Dho Tarap is a traditional agricultural village, surrounded by fields. 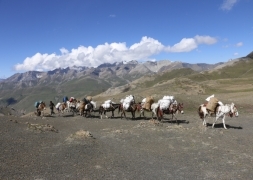 Yaks are used to plough the land. 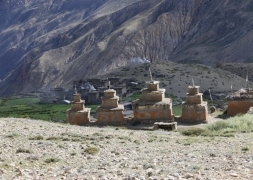 Barley, buckwheat and potatoes are among the few crops that can grow in this barren landscapeThe houses are made of stones found in the river valley and are in typical Tibetan style, with small windows and the flat roofs stocked with firewood. 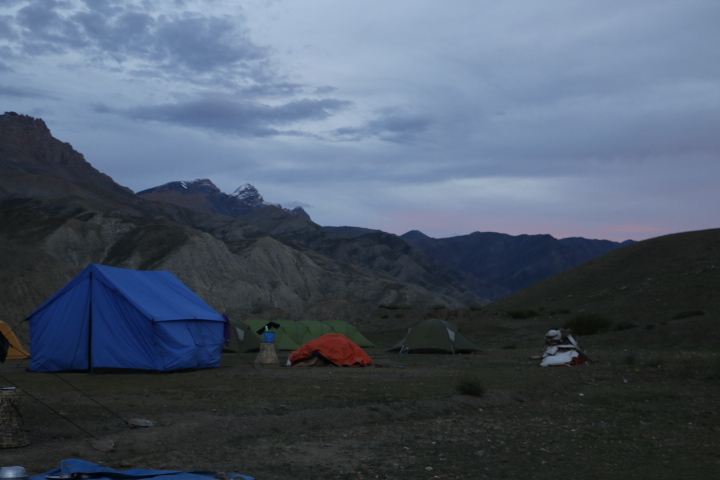 Early morning trek to Numa la pass give us the spectacular view of the mountain ranges from the pass. 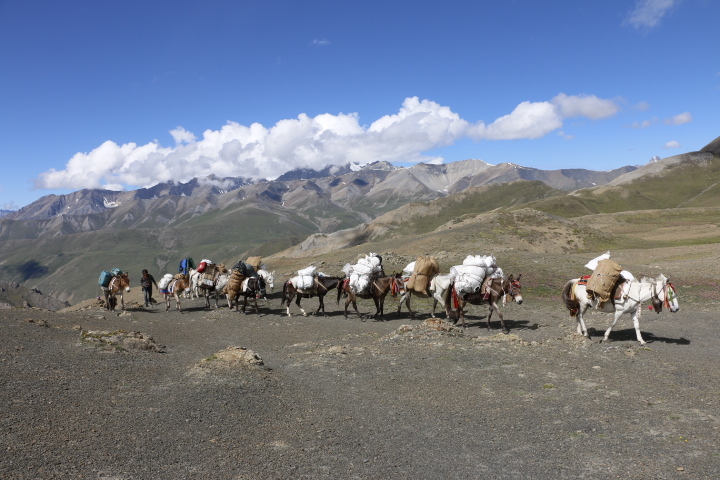 It's a long and strenuous climb of about 3 hours to Numa La (la means pass) at 5318 m. The altitude makes that we go slowly and we get out of breath quickly. We have a stunning view from the pass on countless snowcapped mountains. Dhaulagiri (8167 m) , Annapurna and Manaslu Range, the Shey Shikar (6139 m), Kanjirowa (6883 m) and many, many others. In spring there can be snow on the pass, which makes the crossing a bit harder. After the pass we go down steeply for about an hour. Then the path becomes pretty level and later climbs slowly but steadily again for about an hour. It's an amazing spot close to the river (Panklanga Khola). To the south the beautiful snowcapped Norbung Kang (6085 m) is towering high above the campsite. On the other side of the river there are high pastures, which are often used by yaks to graze. An early start is best. The path continues on the slope on the other side of the Panklanga Khola and climbs pretty steep, going "zig zag" over the slope. Soon we are high above the river. A good 2 hours after leaving the camp we reach the high camp, which is already close to the pass. From here we have an excellent view on the Norbung Kang and the Baga La range Baga La (5190 m). From the pass we have a splendid view on many snowcapped mountains like Kanjirowa and Shey Shikar. After the pass, the path descends pretty steep at the beginning. This part can be icy which makes it slippery, we walk in stunning scenery of huge rocks in all kind of colors with at the Horizon Mountains covered with snow. And then, suddenly, more or less 1 ½ hour after leaving the pass, we will see green bushes and a bit later even trees. Besides, we will see a couple of beautiful waterfalls along the way. It's rather flat and easy walking, very gradually going down, till we reach Yak Kharka (3982 m), another beautiful place to camp. We have a great view of the imposing Kanjirowa Himal (6612 m). Besides, in spring the meadows are full with flowers. The path is beautifully carved out of the rocks and leads to a small pass. After the pass, the path goes into a pine forest. Leaving the forest, we cross a small bridge from which we climb in a couple of minutes to Ringmo. Walking time to Rechi is about 3 ½ hours and from Rechi to Chhepka is 3 ½ hours as well. The path is rather flat at first, but soon climbs steeply up the hill. The walk to Rechi goes almost entirely through beautiful pine forests, with some bushes, birches and other broad leaved trees mixed in. Soon after the top we'll come across Nepal's highest waterfall, a spectacular waterfall of 167 meters high, the Phoksundo Waterfall. More or less one hour after the viewpoint we reach the Amchi Hospital. It's about 1 ½ hours more to Rechi (2940 m). We walk through the forest, with birds singing. The river flows rapidly and is beautiful emerald green at some places. The village Rechi is at the other side of the river. It's a very small village and consists of just a couple of houses and a primary school. The trail stays flat to Chhepka, following the river all the time. We notice that we are descending; not only by the increasing temperature, but also by the difference in vegetation. After about 3 to 3 ½ hours we reach Chhepka, a small village, surrounded by fields of millet and wheat. Descending with some small climbs. We can see a part of the Dhaulagiri range. 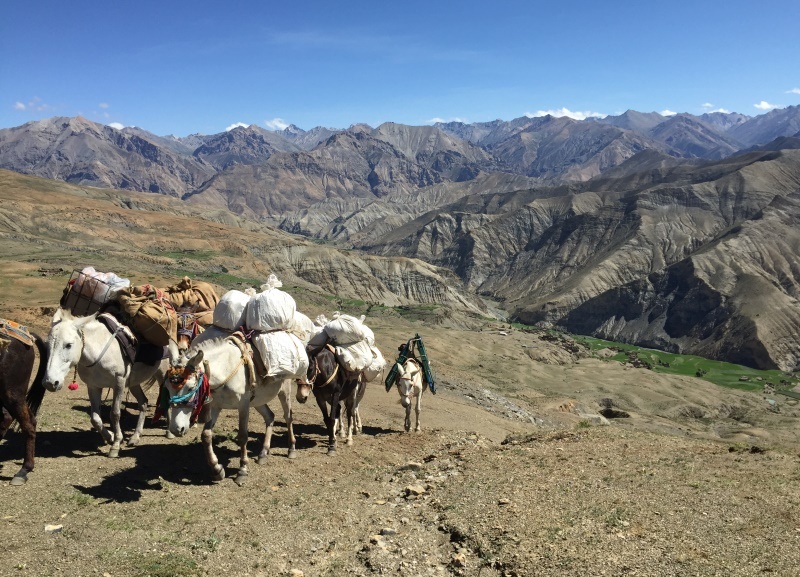 We pass villages like Sangta (2520 m) and Kagbeni (2413 m) and reach the checkpost of the Shey Phoksundo National Park (SPNP) again. After crossing a big iron suspension bridge (the Dhim Bridge, 99 m long) we go left (west) to Juphal .From the bridge, it's about 2½ - 3 hours to Juphal. The first part goes over a large path, passing through the small village of Kalagaonda. It's a pretty steep climb to reach Juphal. Just before arriving, we pass the Hindu village Dangiwada. Juphal is a large village with a small bazaar where it is nice to spend some time looking around.we stay overnight at local guest house. To get to know the price please write an inquiry to us. Hotel in Kathmandu: 3 star standard hotel with bed and breakfast.